Eileen Murphy's copy of Juliet Cook's new poetry chapbook "From One Ruined Human to Another" (in the middle of two other books, mentioned below). Thank you to Eileen for sharing this photo. 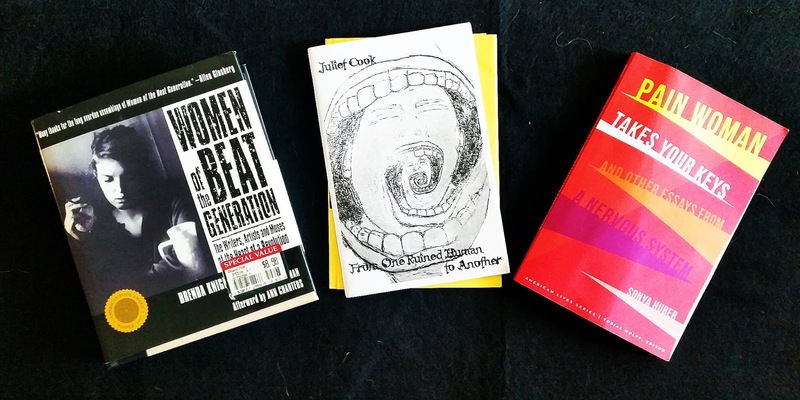 Here's what Eileen said about her photo: "Here's what I've been reading this week--Women of the Beat Generation by Brenda Knight (MJF Books 2000), the new, irreverent chapbook by Juliet Cook called From One Ruined Human to Another (CWP Collective Press 2018), and Pain Woman Takes Your Keys and Other Essays from a Nervous System (by Sonya Huber, U of Nebraska Press 2017). I'm enjoying these books, and thought you might enjoy them, too."